“The Azores? Where’s that?” was the common response when I told people where I was going on vacation. I would explain that they are part of Portugal and are a chain of 9 volcanic islands, 1000 miles west of Lisbon. 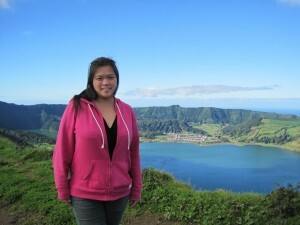 Now that I have returned, I can best describe the Azores as a blend of Ireland (lush, verdant hills/mountains everywhere you look), Iceland (geothermal activity and sparsely populated) and a Caribbean Island (72, sunny and I was eating pineapple everyday). 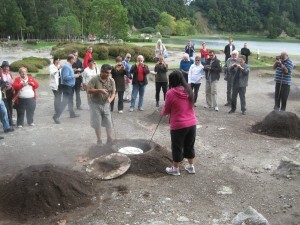 It is a beautiful country with green mountains, blue lakes and black sand beaches. It is also the cleanest country I have ever been to. The people are reserved but friendly and most seemed to speak English. It is only a short 5 hour flight away from Boston and I urge to you explore this gem before it becomes over run with tourists. 1. 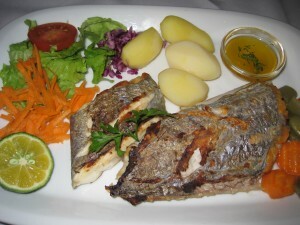 It is important to like seafood, if you are vacationing there – we had it at almost every meal. The selection is endless: swordfish, tuna, sardines, weckfish, shrimp, shellfish, as well as other fishes that seemed to have no translation. 2. The cheeses are tasty. The weather in the Azores is very mild; it never drops below freezing so the cows are free to roam around the pastures all year long. 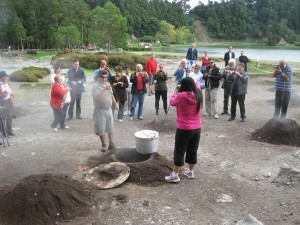 Our guide, Eduardo, told us that this leads to happy cows and delicious cheeses. 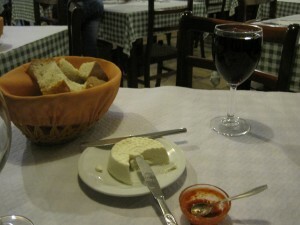 We started most meals with a large basket of bread and queso fresco, a fresh, mild, creamy farmer’s cheese. You could top it with jam or spicy pimento pepper sauce. It was delicious and I bought a jar of the sauce home, in hopes of locating a local source of queso fresco to recreate my experience. 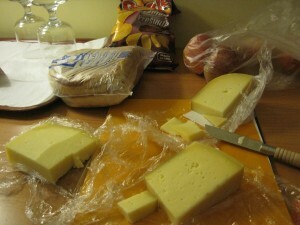 They produce many types of cheese, but queso fresco is the one I miss already. 3. Wine is cheap, plentiful and delicious. There was one meal where Carol and I attempted to each order a glass of red wine. Something was lost in translation and they brought us a bottle. The bill came and it was 6 euros ($9). The markup on wine appears to be 10%, as opposed to the 300% it is in the States. They also believe in a generous pour – our wine glasses were always filled to the rim. 4. There is a lack of green vegetables. Most entrées are served with rice or boiled potatoes. If you do get a side of salad, it will be a few leaves of lettuce topped with shredded carrots. 5. 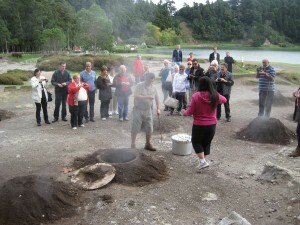 Azoreans love sugar. 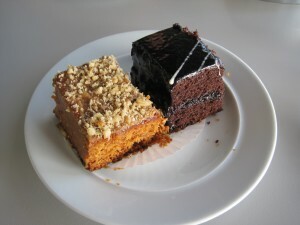 Their cookies, pastry, cakes, liquors, and jams are all very very sweet. 6. 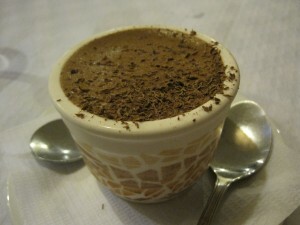 Coffee is served after dessert, so you have to ask specifically if you would like your espresso and sweet together. 7. The food and drink are affordable by US standards and downright cheap for Europe. 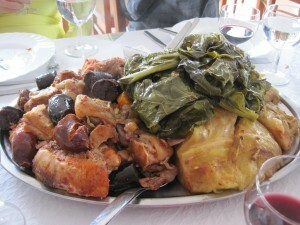 Despite what I said about the seafood, one meal you absolutely must have while in the Azores is a cozida. 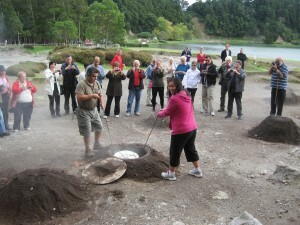 In the town of Furnas, they use the geothermal heat to cook the cozida. A large pot is layered with beef, pork, chicken, blood sausage, chorizo, potatoes, yams, taro, cabbage, kale, onions and garlic. 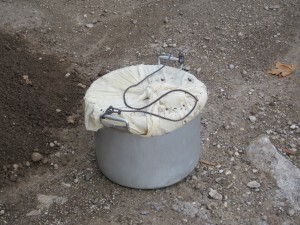 It is wrapped up and lowered in to a hole in the ground. 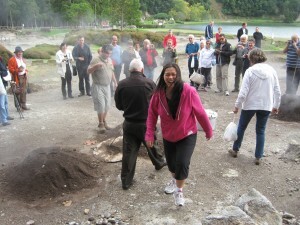 It steams for 6-7 hours and after it is unearthed you have the most delicious and tender assortment of meats and veggies. 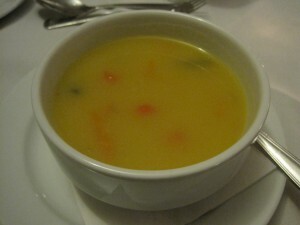 I told Eduardo about my blog and my love of food and he asked if I would like to help lift the cozida out? Absolutely! 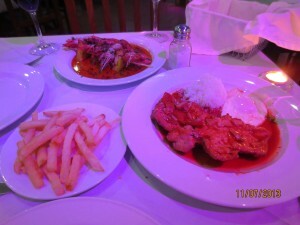 O Corisco (Ponta Delgada) – This was our first night and we both ordered the 15 euro prix fixe menu. They started the meal with free sparking wine, the delicious queso fresco, bland bread soup, the fish of the day (which I still don’t know what I ate, but it was good), wine and dessert. 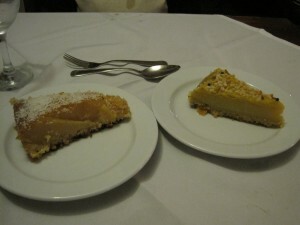 We tried a coconut cake and an almond cake – both were dry. The place was filled with other tourists from our hotel. Paladares da Quinta (Lagoa) – Since this was including in our full day tour of attractions in the West part of the island (Sete Cidades & Lagoa do Fogo), I was not expecting much, but this was the best swordfish of the trip. 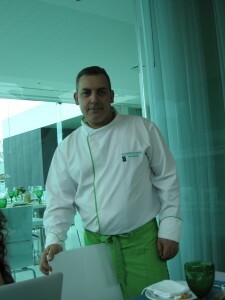 Our chef also looked like a Portuguese George Clooney. 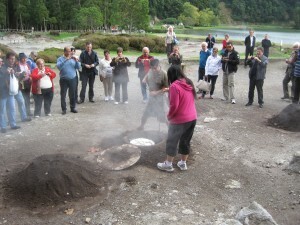 Adega Regional (Ponta Delgada) – This is a small family run restaurant and it appeared to be filled with locals. 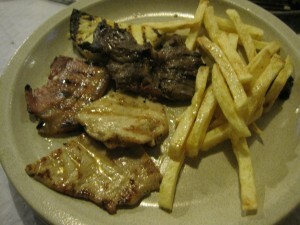 Carol and I shared a mixed grill of chicken, beef and pork. The pork was the best – it tasted like thick cut bacon, but even the chicken was tender. 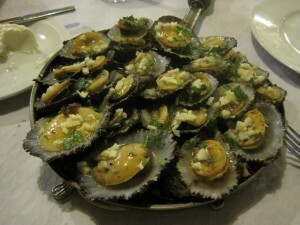 This is where I tried limpets, a local shellfish, similar to clams. They grill them on the half shell and cover them with enough garlic to kill a colony of Azorean vampires. Some were chewy, but I really enjoyed them. We finished with a rich, homemade chocolate mousse. Our meal was extremely affordable. 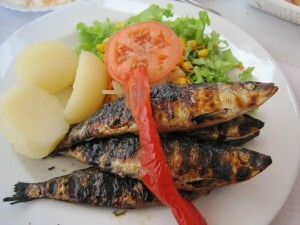 Casa De Pasto Restaurante, O Avião (Ponta Delgada) – My grilled sardines were amazing; they were huge (5-6 inches long) and smoky and tender. It was my favorite fish dish of the whole trip. 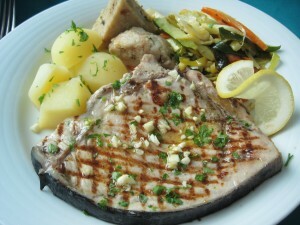 Carol had a mixed grilled fish entrée (Swordfish, tuna, weckfish). We sat outside for 2 hours and drank the bottle of wine they (mistakenly) brought us. 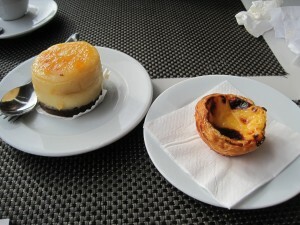 A Colmeia Café (Ponta Delgada) – A Colmeia is a fine dining establishment and A Colmeia Café is its more casual sister restaurant. It is nicely situated across from the marina; Carol and I went here 3 times to have our afternoon espresso and sweet. They were friendly and did not mind that we sat for hours reading and enjoying the view of the water. The cakes and pastries were only okay, but the view made up for any of the food’s shortcomings. 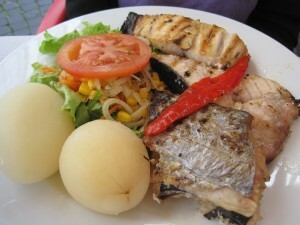 Sao Pedro (Ponta Delgada) – This was easily the most expensive meal of our trip, coming in at 50 euros. 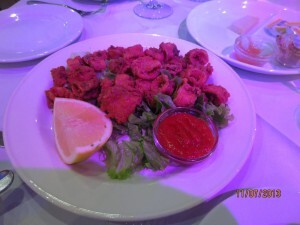 We started with tough, dry fried calamari, but my head-on shrimp with grilled pineapple was excellent. We also got the pork picante, a traditional pork dish. It was flavorful, but tough. We did not even bother with dessert.